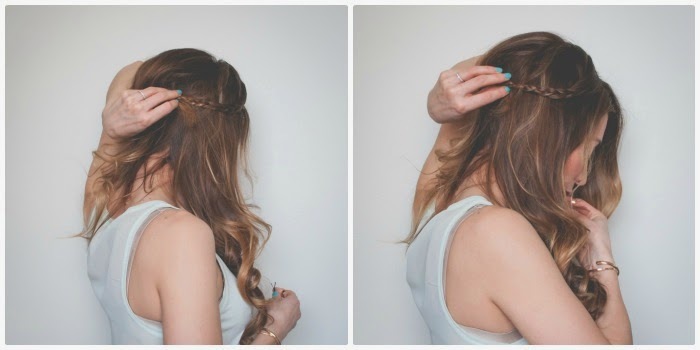 Braided Half Crown - Easy Hair Tutorial | La Petite Noob | A Toronto-Based Fashion and Lifestyle Blog. Start with hair that has some texture - I just quickly curled my hair, but any added texture will do.. even bedhead! Give your hair some volume at the roots. You may wish to add volume by using hair product, but I like to channel the old Italian lady in me and pull out my trusty teasing comb to achieve a big-hair look. Once you have your desired volume, it's time to start braiding. 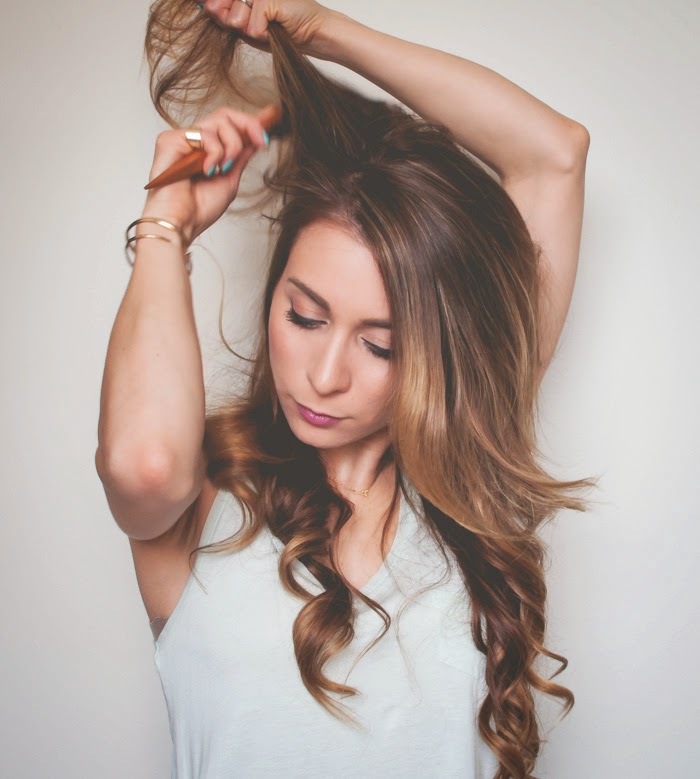 Grab a piece of hair about once inch wide, about a quarter of the way into your head. 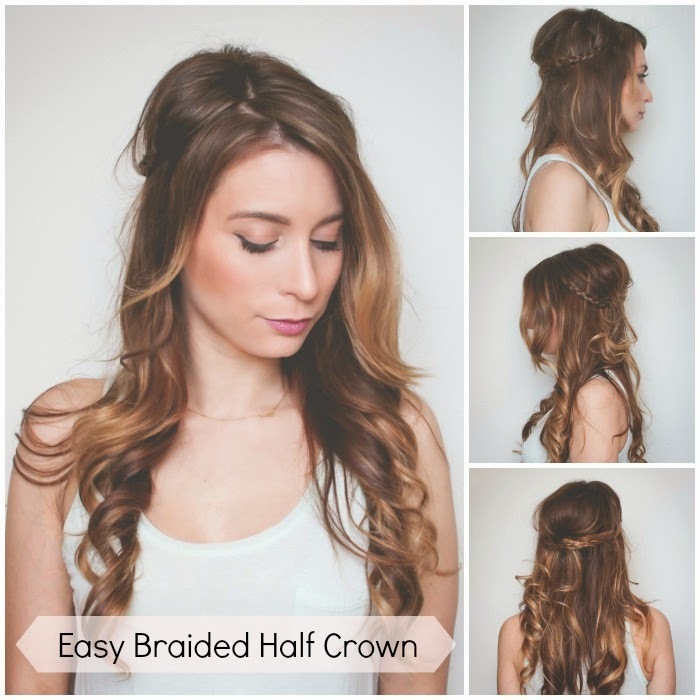 The braided half crown looks more bohemian and casual when you leave a sizeable amount of bangs loose. Start braiding that piece of hair, all the way down until you reach the ends. Once you complete the braid, secure the ends in place with either a small elastic or a bobby pin. Leave that braid for now - we need to repeat the same step on the other side of your head. Repeat the same step on the other side of your head - grabbing a one inch section of hair and braiding all the way down to the ends. Again, you want to leave a good amount of bangs loose, so start your braid one quarter of the way down your head. Give your hair another extra bit of volume, right at the crown. This will not only add to the aesthetic of the braided half crown, but also help the braids themselves stay in place when we start pinning. Take each braid, and pin it securely to the back of your head using bobby pins. You will want to pin one braid on top of the other, about halfway down the back of your head. Once you had both braids pinned securely in place, one on top of the other, it's time to clean up the braided crown. Any loose ends sticking out for either braid can by tucked under the crown and pinned into place. The same process can be done with any flyways you see. Keep on pinning until you are only left with two braids visible. Done - you now have a braided half crown that perfectly compliments any flowy maxi dress or romantic chiffon you plan to wear this summer. Will you try out this simple summer hair style? I love this hairstyle! It's so simple yet cute. I'm adding it to my list of potential prom hairstyles but I don't think it would look as good on me as it does on you aha. From start to finish, this style took maybe about 10 minutes - but I like the messy look, so it may take a little longer if you wanted something cleaner. Have a great time!